Here you will find the most up-to-date information on events taking place for the 1st Buckie Boys’ Brigade. Use the bar at the right hand side of the calendar to scroll through the month. Use the arrow buttons at the top of the calendar to move between months. Click on the “Today” button to return to the present day. Please note : Whilst every effort is made to keep the calendar up-to-date it may be necessary to change events due to unforeseen circumstances. Anyone unsure of dates, times etc should contact a member of staff. Please click on the button below to open the calendar. 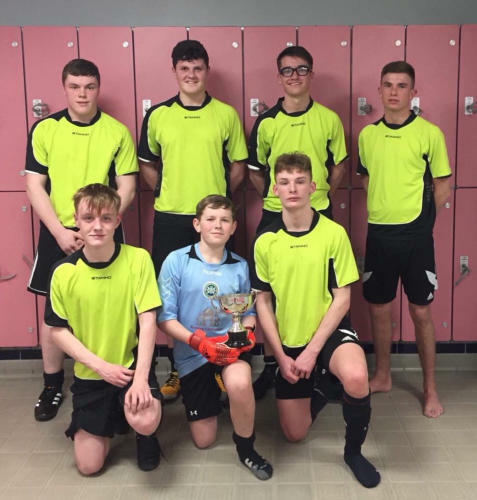 NEWS 20.04.2018 - 1st Buckie Finish Third in Belfast 1st Buckie Senior 5 Aside football team finished 3rd in the UK final held in Belfast. Pictured are : Tommie Marandola, Evan Smith, Jamie Wood, Brodie Christie, Innes Mckay, Jay Flett, Finlay Mckay. 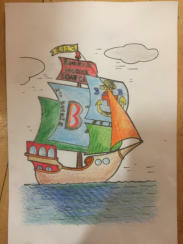 19.03.2018 - Anchor Boys’ Colouring Competition 1st Buckie Anchor Boys Boat club colouring competition winners. Again a very tough job for the judges to pick out the successful winners. 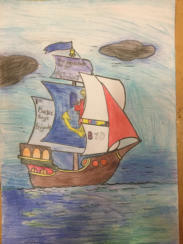 Below are 1st 2nd & 3rd places in the Primary 2 & 3 Sections for Anchor Boys. 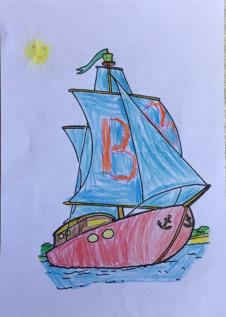 Primary 2 : 1st - Patrick Smith, 2nd - Seth Coull & 3rd - Ellis Geddes Primary 3 : 1st - Andrew Slater, 2nd - Jose Imlach & 3rd - Rino Taylor Below you will see the photos of the winning colouring in from each age group. Well done to all boys in both age groups who completed their pictures. 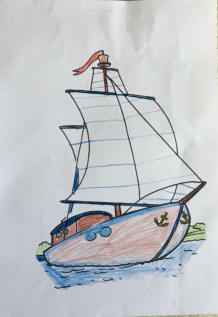 19.03.2018 - Junior Section Colouring Competition 1st Buckie Junior Section Boat club colouring competition winners. The 1st 2nd & 3rd places in the Primary 4,5 & 6 sections are as follows: Primary 4 : 1st - Caleb Lyon, 2nd - Ollie Ewan & 3rd - Josh Innes. 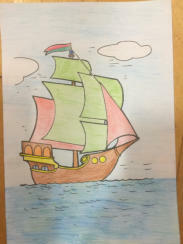 Primary 5 : 1st - Alfie Low, 2nd - Alex Macrae & 3rd - Joe Reid Primary 6 : 1st - Stuart Randall - 2nd - Joe Sutherland & 3rd - Lucas Wood Below you will see the photos of the winning colouring in from each age group. Well done to all boys in all age groups who completed their pictures is was a very hard job for the judges to pick out 3 in each section. 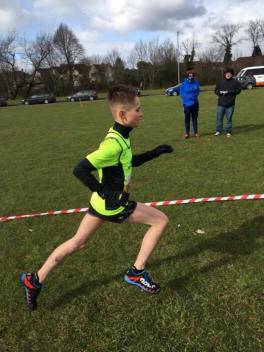 17.03.2018 - Cross Country Massive congratulations to Roy Taylor who competed in the B.B. Scotland cross country championship in the P7/S1 & S2 section this morning in Renfrewshire. Roy was placed a very commendable 6th out of 50+ runners in his section brilliant for being one of the youngest in the section . He has done himself proud, and all of us at 1st Buckie are also very proud of Roy. Well done. 17.03.2018 - Battalion Badminton Results Results of the Banffshire battalion badminton competition held in buckie on Saturday 17/03/18. Well done to all boys from all companies who took Part. 17.03.2018 - Lucky Squares Winner As part of a fundraiser for the senior football teams trip to Belfast for the UK national 5-A- Sides football finals we are great-full to Natalie McIntosh who ran and organised a "Lucky Squares" raffle on the company's behalf. 150 numbers sold at £10 each. 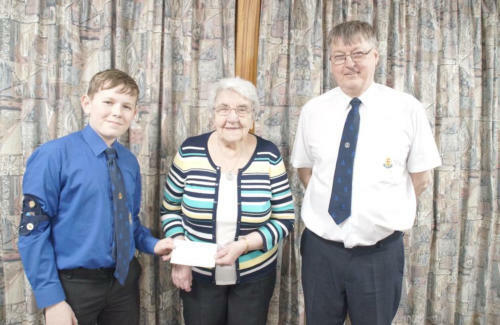 £500 to the lucky winner who was Marion Tawse pictured below receiving her prize from Finlay McKay the team's goal keeper and captain Alan McIntosh. Marion was Lucky number 8 picked out by Findlay at a live draw aired on social media a couple of weeks ago. A massive thanks everyone who bought lucky squares, this fundraiser generated £1000 towards the teams trip. We wish the boys the best of luck for the finals, everyone associated with 1st Buckie is extremely proud of our 5–A-Side team. 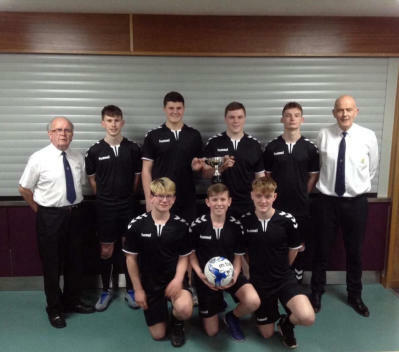 17.02.2018 - 1st Buckie Senior Boys are Scottish Champions The boys won the 5 Aside cup at Grangemouth last week - now to Belfast on 14th April for Uk finals. Good luck boys. 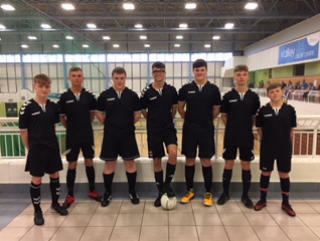 Pictured are : back row Jamie Wood Innes McKay Brodie Christie and Evan Smith Front Tommie Marandola Finlay McKay and Jay Flett. Click here for news article Archived News If you are looking for news from previous events click here. 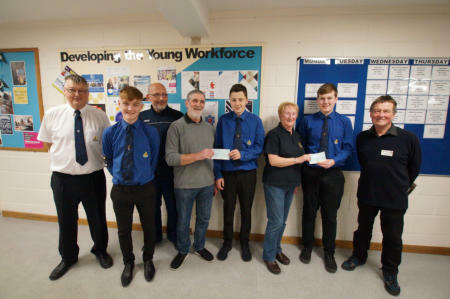 16.11.2018 - Queen’s Men Make Donations to Buckpool Victoria Bownling Club & Buckie & District Fishing Heritage. The Queen’s men decided to share some of the money raised backpacking at tesco on the 27th October with two local worthy causes. 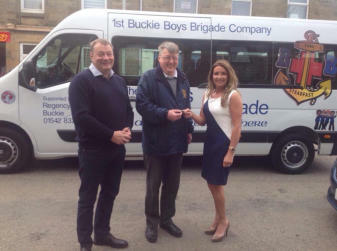 John O’Mahoney, Margaret Sutherland & Adam Robertson receiving the cheques along with Richard Boyd from Tesco Buckie 05.05.2018 - Regency Donate Minibus to 1st Buckie BB’s This morning the 1st Buckie B.B. were surprised in a momentous way By Mr Charles Milne of REGENCY CAR SALES BUCKIE as he arrived at Alan McIntosh front door and handed over a set of Keys to the Company’s very own Vauxhall mini bus. 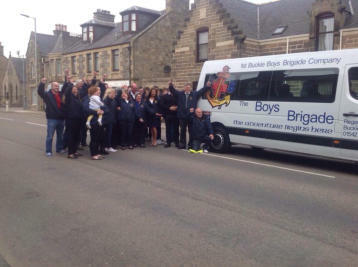 This is an unbelievable gesture of kindness and support towards the company from Mr Milne who has been a sponsor of 1st Buckie for many years now, and this mornings gift of a Mini Bus for Company Use has blown the officers and boys away. Pictured are Mr and Mrs Milne handing over the keys to company Captain Alan McIntosh and also some company representatives who were present for the secret handover this morning they had no idea why they had been asked to meet this morning. We Can’t thank Charles Milne enough for our new Bus. 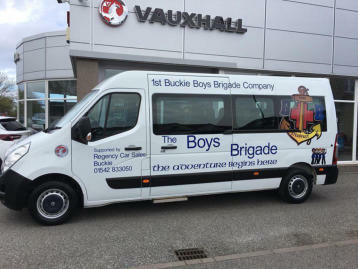 Even the number plate is BUCKIE (BU11CKE) our boys certainly won’t be missed out and about on the road and everyone will know the buckie boys have arrived when we go to various B.B. events...... keep an eye out in the local press for a full article on Charles very kind gesture towards 1st Buckie from Regency Car Sales - Buckie driving 1st Buckie forwards. More photos on Regency Car Sales and 1st Buckie BB Facebook pages. 01.03.2019 - 5 Aside Scottish Champions Here we see our Scottish Champions 5-A-Side Team. We are ever so proud of their achievement and wish them luck as they now travel to Derby in England on the 11th April to Represent Scotland in the BB UK&I National Finals. Back Row L-R Charlie Hay Innes McKay Jamie Wood Jay FlettFront Row L-R Neil Gillies FindlayMcKay Tommie Marandola. Also Mr G Pirie and Mr M Smith who have traveled with the lads all over. Well done again lads and we are sure you will do BB Scotland, 1st Buckie and yourself proud in the Nationals in Derby.